There are three elements to this dish. The curry itself, the sides and the paste. This recipe uses a paste which has been created from scratch. If you choose to buy a jar of ready-made green paste, be careful because some brands contain lots of extras like refined white sugar and even shellfish. 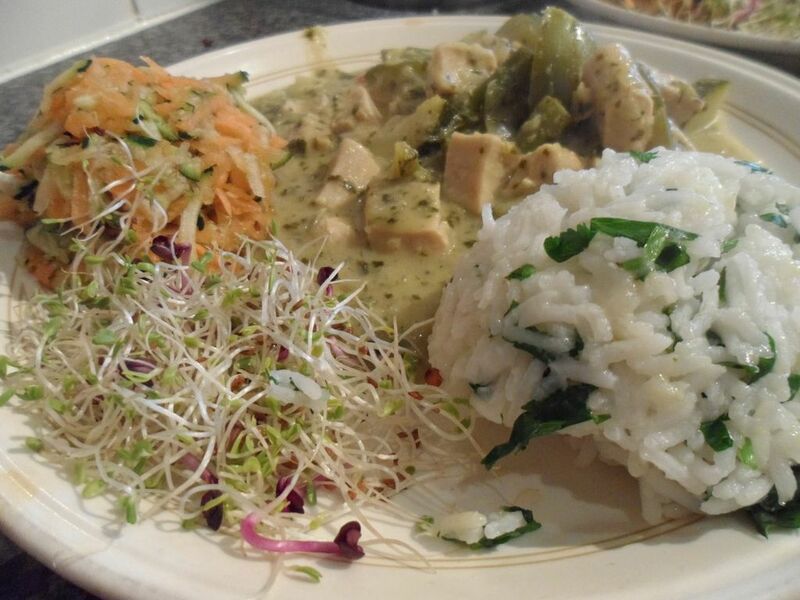 1) Place all ‘paste’ ingredients in a food processor or blender and blitz to create a fragrant green curry paste. 2) Place a wok or large frying pan over medium-high heat. Add 1-2 Tbsp. oil and swirl around, then add all the green curry paste you just made. Stir-fry 1 minute to release the fragrance. 3) Add the tofu or chickpeas. Stir-fry until well saturated with sauce. 4) Add the stock. Stir and reduce heat to medium-low. Gently simmer 5 minutes. 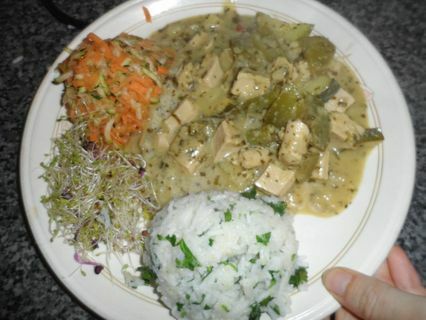 5) Add the coconut milk, plus vegetables and continue simmering 5-7 minutes, or until softened. Then turn the heat to the lowest setting and allow the flavours to infuse. 6) In the meantime, place your preferred amount of white rice into a pan of boiling water and follow the cooking instructions on the back of the pack. Drain and mix with some chopped coriander. 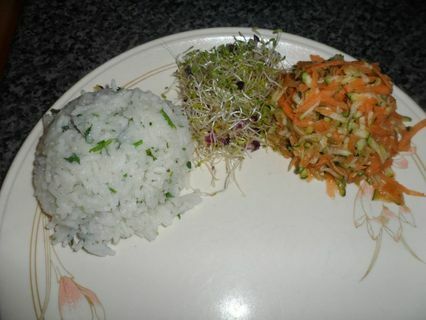 7) Place your sprouts on the plate. 9) To get them into nice balls, place them into a small bowl and place upside down on the plate. Remove and they will stay in place. The same applies to the rice if you wish. 10) Now it’s time to plate up the curry and enjoy!